If you love cats, you will love the Egyptian Mau cat pictures presented here. 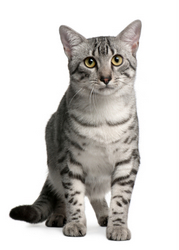 Egyptian Mau cats are best-known for their beautiful spotted coats. Interestingly, they are one of the few naturally spotted cat breeds. The exact origin of these wild-looking cats is not known. However, experts believe that cats of this breed may be descendants of the African wild cats. Many Ancient Egyptian murals depicted cats that had a striking resemblance to the modern Egyptian Maus. Egyptian Maus are very vocal. They love to talk. They are also very agile. In fact, they are the fastest of the domestic cats. Cats of this breed have short hair. Fortunately, they require little grooming. They are slim but muscular. The three official colors of the Egyptian Mau are: bronze, silver, and smoke or black smoke. Egyptian Maus are loyal and very friendly. They make great family pets. If you are looking cat lover gifts, consider giving a picture showcasing Egyptian Maus. Below you will find a few affordable selections. She's an Egyptian Mau, the rarest of breeds. In addition to pictures, you will also find other gifts inspired by Egyptian Maus, including books, charms and necklaces. Here are a few ideas from Amazon.com. These Egyptian Mau cat pictures are brought to you in affiliation with Art.com. I love collecting quotes about cats. They can be funny, insightful and right on the money. Here are a few interesting cat quotes.